…is now available for purchase at our bandcamp site for the sum of £5.99. Our Head Technician will be performing a live set at this esteemed organisation on the 17th February. Newly installed at Sticky Mike’s Frog Bar, the prospect of an interesting night is assured. 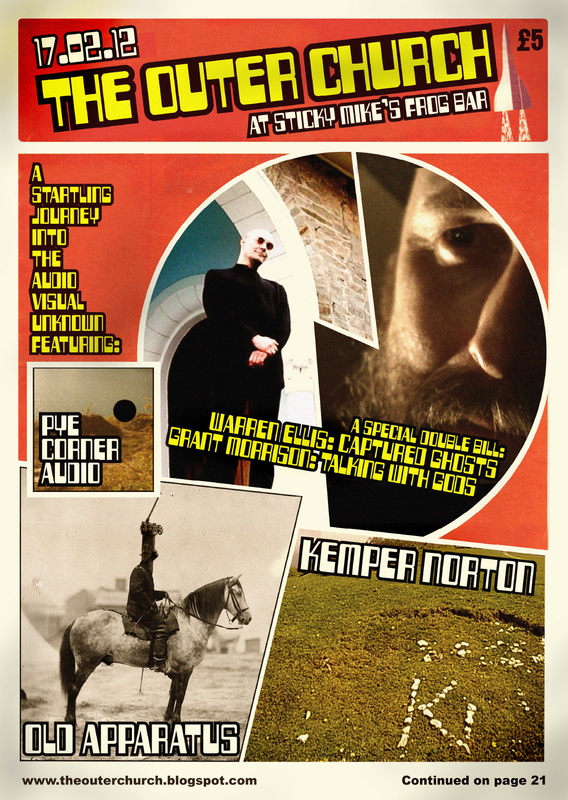 Performances from Old Apparatus and slurtronic folkster (it says here) Kemper Norton mean this will be an amazing event. Also featured are not one, but two documentaries about Warren Ellis (not an Australian musician) and Grant Morrison. Captured Ghosts and Talking With Gods give an insight into the lives and careers of these visionary writers. Advance booking is highly recommended. Tickets are available here http://www.wegottickets.com/event/152811 for £5. Pipe aficionado, analogue evangelist and inventor of the 'psychic stereophonic reproduction' technique. Currently perfecting his wood-fired mastering method.